Using Backup4all you can easily backup to FTP by selecting your FTP server as a destination. You can define the FTP configuration and using the security details that you have (username/password) your data can be backed up onto the FTP server. Most FTP servers have rules against hammering (trying repeatedly to connect to an unavailable FTP server with little time between attempts). This is why they require retry times at specific intervals, commonly at least 60 seconds between attempts. They also monitor for computers that hammer and once detected, the server will ban access to the IP address either permanently or for limited time. Thus, when you set the retry times intervals in File -> Options -> FTP, you should use 60 seconds or more. When selecting a hosting provider that offers FTP access for your FTP backup, consider these elements too: if they have a backup plan too, if they provide high speed connection and if they have your data on servers with restricted access. If you have a bad Internet connection and you cannot upload large backup files because of the interruptions, you should use the Mirror backup type that resumes the backup only if the internet connection was interrupted, not if you press Cancel. 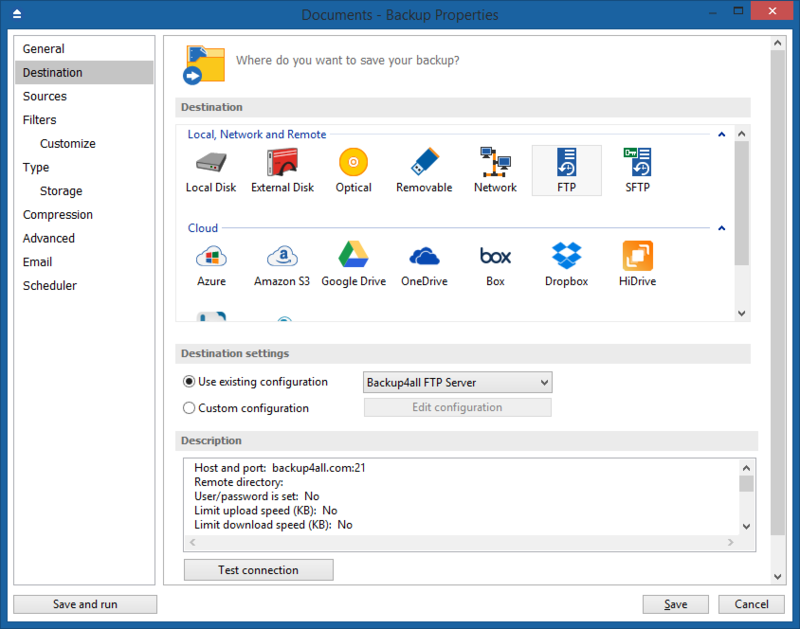 Using Backup4all you can also back up files from an FTP location to a local drive. As in Backup4all you cannot add the source files and folders directly from the FTP server, you need an application to map the FTP server as a local drive. Before using FTP as a destination for backing up, you should define a new FTP configuration using the File -> Options -> Online Destinations -> FTP window. Once defined, you will be able to apply this FTP configuration to individual backup jobs. Configuration name - Enter here an arbitrary name for the connection. Port - In this field you have to enter the port number if different than the default FTP ports (21). Destination folder - Here you can enter the destination path if different than root. User name - If this is a private FTP server (no anonymous access allowed) enter the user name for your account. Password - In this field enter the password for the FTP server. There are FTP servers that allow anonymous access (public FTP servers). You can connect to these types of FTP servers using as user name Anonymous and your email address as password. It is not recommended to backup important files to public FTP servers. In the When destination server is not ready section you can enter the number of attempts and time between those attempts to connect to the FTP server. By default, if the FTP server is not reachable, Backup4all will try 3 times at a 5 seconds delay before aborting the backup. You can increase or decrease these values using the Retry and wait fields. Additional settings like bandwidth, SSL connection and firewall can also be configured from this page. Once you have finished defining the connection, press the Test button to check if the FTP details you have entered are correct. If the test was successful, The ftp connection was tested successfully message will be displayed. When defining a new backup job using the New Backup Wizard, select the FTP option in the destination section (1st page of the wizard). If you already have a backup job defined and want to change the destination to FTP, select that backup job, open the Properties window (Ctrl+P), go to the Destination page and select FTP server. After that, go to FTP server page and specify an existing FTP configuration or create a new one. From the Use existing configuration select an already defined FTP configuration (given that you added one in the File -> Options -> Online Destination -> FTP window). 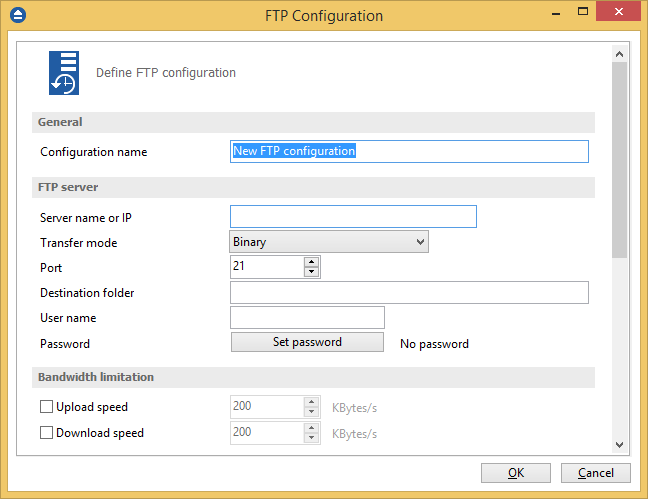 The description of the selected FTP configuration will be listed bellow. You can change the defined settings by selecting the Custom configuration option and pressing the Edit configuration button. Here you can modify the data in the fields and press OK to save. However, if you do changes, it is recommended to use the Test FTP connection button to see if the FTP settings are correct. Once you press the OK button, Backup4all will try to connect to the FTP server to see if a backup catalog already exists on the destination. If the FTP destination is not available, a Cannot connect to the FTP server message is displayed in the status bar (bottom of the main window). In the File -> Options -> Backup window you can set the number of retries and the time between the retries when the FTP server is unavailable (the When destination not ready section). This article shows you how to create a backup to FTP destination using SSL encryption. When you connect through FTP to a remote computer you send the username and password in clear, unencrypted text. Anyone along the route can access what you are sending, including your username and password, if the data is not encrypted.